Meade, KS, November 2017 – In celebration of National Rural Health Day, November 16, 2017, Meade District Hospital announces it has been recognized by The Chartis Center for Rural Health/iVantage Health Analytics and the National Organization of State Office of Rural Health (NOSORH) for overall excellence in Quality, reflecting top quartile performance among all rural hospitals in the nation. 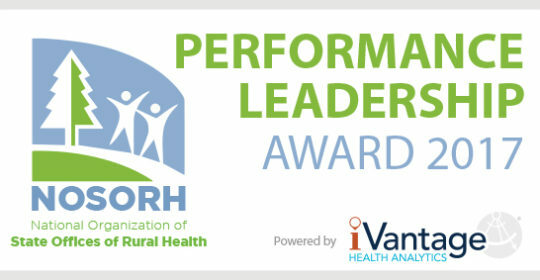 We are honored to receive this recognition for Performance Leadership in Quality. Every aspect of our operations within Meade District Hospital is involved in our quality performance. This includes all health care services, surgeries, patient safety and nutrition, materials management, diagnostics, compliance, infection control and even financial and operational activities. Managers in all of these areas serve as part of our Continuous Quality Improvement task force. This group allows us to keep an intentional focus on our quality measures and performance. Overall, I’m very pleased with how our organization works together to ensure our quality is the best. I want to thank all of our employees for their dedication and hard work which has led to our receipt of this award.